Living an alternative lifestyle in the coastal mountains of Oregon, Michael Hemmer builds hand forged kitchen cutlery from high-carbon steel utilizing a practice used since ancient times. Every knife is unique unto itself. The handles are crafted with woods from sustainable locations and include Padouk, Myrtle, and Walnut among others. Michael has be know to salvage various vintage timber saws for reuse as blades. 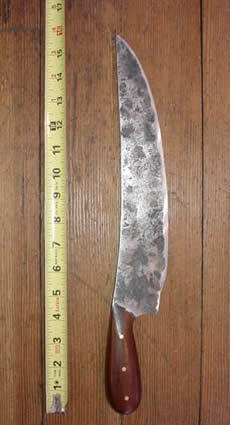 Knives of this caliber are said to last and carry edge longer than most. Judging by his waiting list, Michael's work seems to speak for itself. Click here for more American made Blacksmith craft.